Kofta Kebabs have been a favorite of my husband’s since he was a little boy growing up in Pakistan. For those who don’t know kofta are kebabs made of spiced ground meat. We make them several times a month in our house….all different varieties. I am constantly on the lookout for new recipes. I found this recipe in FOOD Everyday magazine. I tweaked the amounts on the spices a little bit to meet our taste preferences. The recipe came together fairly easily and is perfect for a weeknight meal. Give them a try if you are looking for something new to add to your dinner rotation! Heat broiler, with rack in highest position. In a large bowl, combine chicken, egg whites, breadcrumbs, onion, cilantro, garlic, salt, and spices and mix until well blended. Line a rimmed baking sheet with foil and drizzle with 1 tablespoon oil. Divide chicken mixture into 8 portions and place on sheet. Shape each into an oval patty and use your hand to flatten slightly. Drizzle 1 tablespoon oil over patties. Broil until lightly browned, about 4 minutes. Flip and cook until cooked though, about 4 minutes more. Yogurt Sauce: In a small bowl, stir together yogurt, mint and lime juice. Season with salt and pepper. 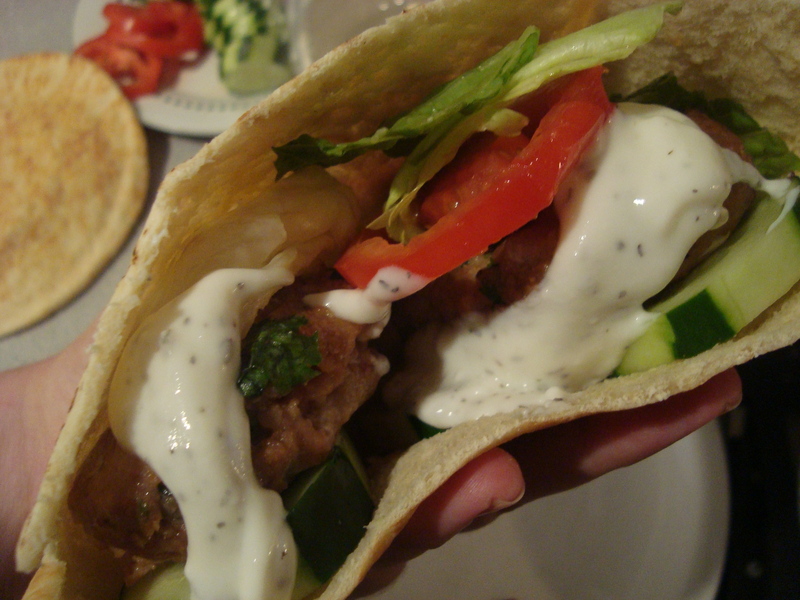 Serve patties in pita pockets with lettuce, tomato, cucumber, and yogurt sauce. This past weekend I returned to one of my favorite cookbooks The Sultan’s Kitchen: A Turkish Cookbook. I was looking for a rice recipe to go with some kofta kebabs that we were grilling for dinner. I landed on the Muccedere (a Turkish rice pilaf) recipe which I altered a bit because I didn’t have any orzo and hadn’t planned ahead enough to soak dried chick peas. Someday I will constantly have a well-stocked pantry. Sigh. For now, I need to deal with my limited storage space. 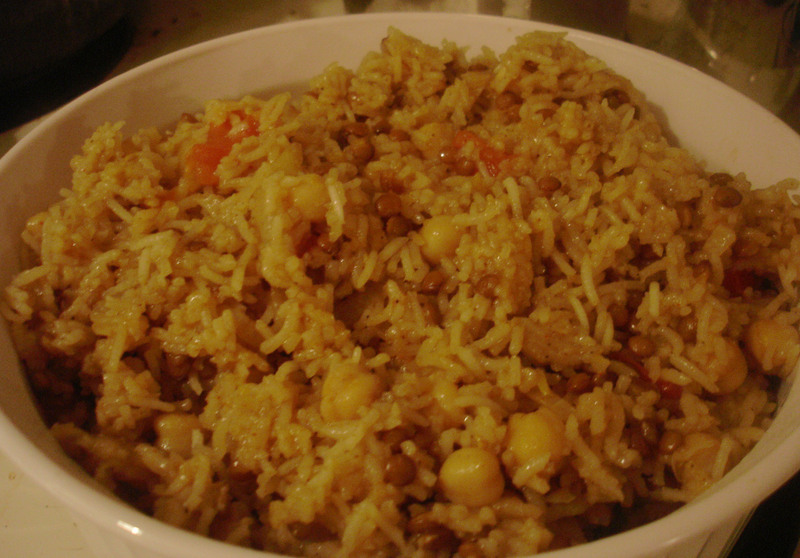 This rice is spiced with cumin & red pepper and is dotted with lentils, chick peas, tomatoes and caramelized onions. I have made it a couple of times before and it always gets two thumbs up from Mr. Mango. It is a perfect accompaniment for grilled kebabs and yogurt sauce. Add a nice chopped salad and you have a perfect meal! Cook dried lentils in small saucepan with 2/3 cup water. Bring to a boil, then simmer until just tender, about 15-20 minutes. In a heavy, medium sized saucepan, heat the olive oil over medium heat. Add the onions and sugar, and season with salt and pepper. Cover the saucepan and cook gently, 5 minutes, or until the onions are tender. Uncover the pan, increase the heat to high, and stir in the lemon juice. Cook, stirring, until the onions are browned. Add the rice and cook, stirring, for 2 minutes. Add the tomatoes, lentils, chickpeas, cumin, and red pepper. Pour in the stock. Lower the heat and over the saucepan, and cook gently for about 20 minutes, or until all the liquid has been absorbed. Optionally, stir in the parsley. As I’ve stated previously, we LOVE, LOVE, LOVE Turkish food. It is Ramadan, and during his long days of fasting, my man develops cravings as to what he wants for dinner to break his fast. 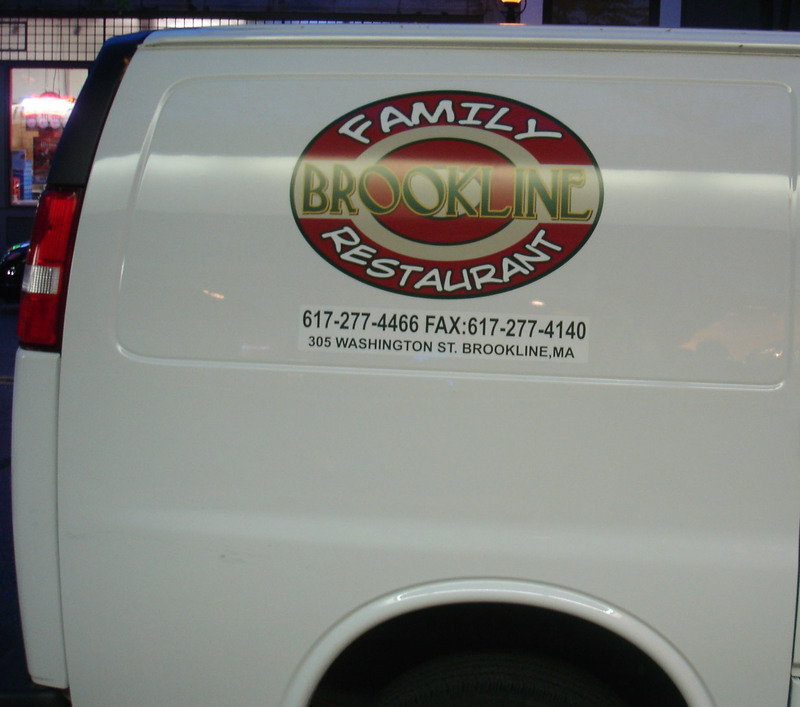 So, Saturday afternoon I got a call from him saying “Let’s go to that Turkish place in Brookline Village.” He could only mean the Brookline Family Restaurant. Once he got home, we piled in the car and drove to Brookline Village where parking was at a premium and apparently so were tables at Brookline Family Restaurant. There was a crowd of about 12 people waiting outside for a table. My husband parked the car and I ran in to put our name on the list. There was a big empty table for 12 with a reserved sign on it and they said there was a 7 PM reservation. It was 7:05. But okay, maybe the people were having trouble parking. We went back outside to wait. At 7:15 my husband broke his fast with some dates supplied gratis by the staff. About 10 minutes later they must’ve given up on the reservation ever showing up so they seating a bunch of the waiting parties… us among them. We ordered our small feast of cold okra appetizer, Lahmacun (Turkish style pizza topped with ground lamb and veggies), Adana Kebab (ground lamb blended with spices), and a special of Roasted Eggplant stuffed with ground lamb. 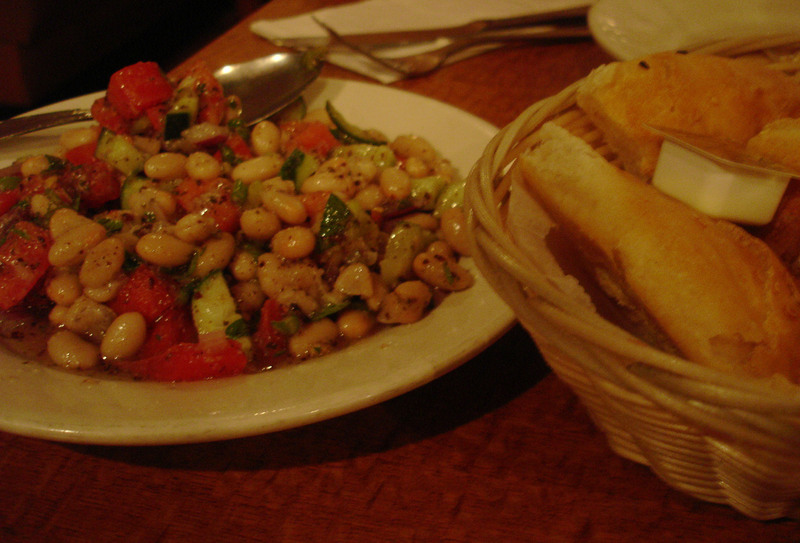 After we ordered they brought some complimentary bread and a white bean salad to the table. We love this white bean salad. It is flavorful with lemon juice and spices. 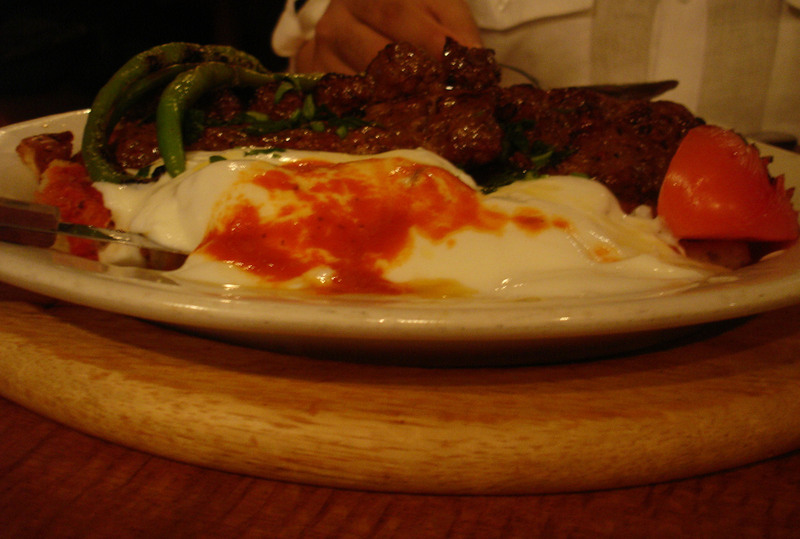 Turkish food has a happy place in my memories. Back in the early days of my husband and my dating, we used to go out to eat at 2 Boston Turkish Restaurants: Istanbul Cafe (which was on Beacon Hill at the time) and Özcan Ozan’s Financial district restaurant Sultan’s Kitchen. I fell so much in love with Turkish cuisine that I bought Ozan’s The Sultan’s Kitchen: A Turkish Cookbook. It has since become one of my most used and be-splattered cookbooks. I had made the 2 salads several times before but had never tried these particular kebab and rice recipes. I slightly modified some of the recipes based on what I had on hand and our taste preferences.